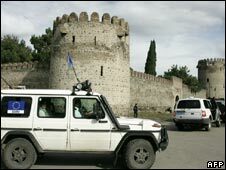 The first European Union observers have entered the buffer zone around South Ossetia, as they begin monitoring a ceasefire between Georgia and Russia. However, some monitoring teams were turned back by Russian troops for what were called "security reasons". More than 200 observers are to oversee a Russian troop pullout from the buffer zones near South Ossetia and Georgia's other breakaway region of Abkhazia. Russia has kept troops there since ousting Georgian forces in August. Moscow says it will complete its troop pullout from the buffer zones by 10 October. On Wednesday, Russian President Dmitry Medvedev said Moscow would abide by its pledge. "Russian peacekeepers will be withdrawn from Georgia within the agreed dates," he said at a meeting with Spanish Prime Minister Jose Luis Rodriguez Zapatero in St Petersburg. On Tuesday, EU foreign policy chief Javier Solana said he was "optimistic that all the parties [would] comply" with a French-brokered peace plan between Moscow and Tbilisi. The plan set 1 October as the date for EU monitors to take up positions inside the buffer zones. 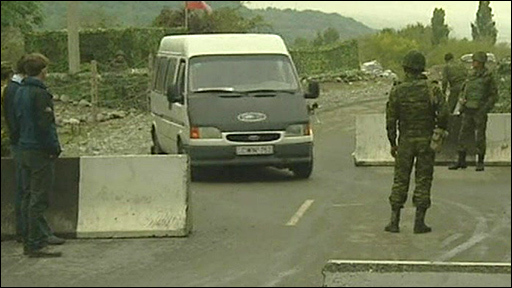 Unarmed observers from the EU Monitoring Mission (EUMM) entered the buffer zone at a Russian military checkpoint near the village of Kvenatkotsa, some 20km (12 miles) west of the Georgian town of Gori. The observers - travelling in light armoured vehicles - were first stopped by the Russians, but after a brief conversation were allowed to move through. Another EU patrol moved into the buffer zone after passing through a Russian checkpoint in Karaleti, north of Gori. But several other EU teams did not even try to enter the buffer zone, because the Russian troops had said they would not be allowed in for "security reasons", says the BBC's Richard Galpin, in Mukhrani, close to the buffer zone. The EUMM's head, Hansjoerg Haber, said he would seek to "clarify" the situation, adding that political assurances about his teams' deployment had been given by the Kremlin. A British member of the team said the EU monitors wanted to take a softly-softly approach on the first day as negotiations continued at a higher level, our correspondent says. Later on Wednesday, an EUMM spokesman said that the observers' first day had gone "smoothly". "Patrols made first contact with authorities and population," the spokesman was quoted by Reuters as saying. The uncertainty was first triggered on Tuesday, when Lt Col Vitaly Manushko, spokesman for Russian forces in South Ossetia, said the monitors would only be able to patrol "up to the southern limit of the security zone". Some 12 EU patrols were operating on Wednesday. Observers from 22 EU nations are deployed in Georgia, many of whom are French gendarmes. There are also experts on human rights and legal issues. As the EU started to deploy its monitors to Georgia, it was confirmed that an international donors' conference would be held in Brussels next month. The United States has pledged $1bn in aid to Georgia, and Europe is expected to match that sum when ministers from 27 EU countries gather at the conference. The European Commission has already agreed a package worth $700m over three years to repair Georgia's infrastructure and revive the economy following the conflict. Russia launched a counter-attack and the Georgian troops were ejected from both South Ossetia and Abkhazia several days later.